The identity of the Cabineers, one of the all-time vintage vocal harmony groups has been a mystery over the years. Admired by collectors today, all but one of their platters were recorded on good old "Big Ten Inch" 78 rpm. Was the group originally from Cleveland? That was the foundation of the earliest rumors, and it has some truth and more than a little mystery to it. 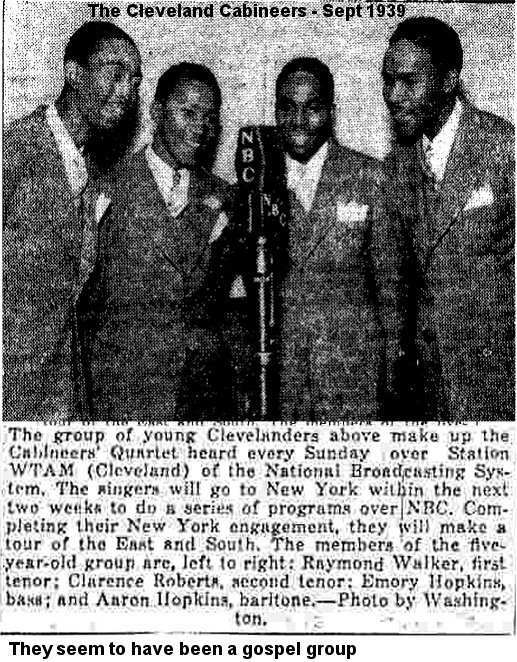 The March 23, 1940 issue of The Cleveland Call ran a photo of: "A group of young Clevelanders who make up The Cabineers Quartet, heard every Sunday over station WTAM (Cleveland) of the National Broadcasting System." 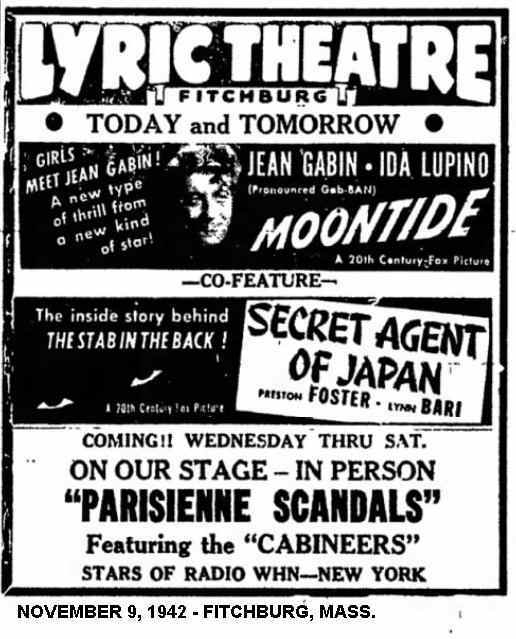 The blurb went on to say that the Cabineers were scheduled to leave in two weeks (that is, April, 1940) to do a series of programs for NBC in New York, followed by a tour of the East and the South. At this point, the group was said to have been singing together for five years. 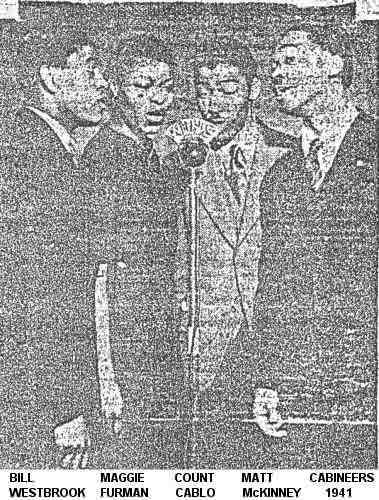 The members were given as: Raymond Walker (first tenor), Clarence Roberts (second tenor), Aaron Hopkins (baritone), and Emory Hopkins (bass). As far as is known, this group never recorded (at least not as "The Cabineers"). They were heard over WTAM from at least July 1939 through September 1940. 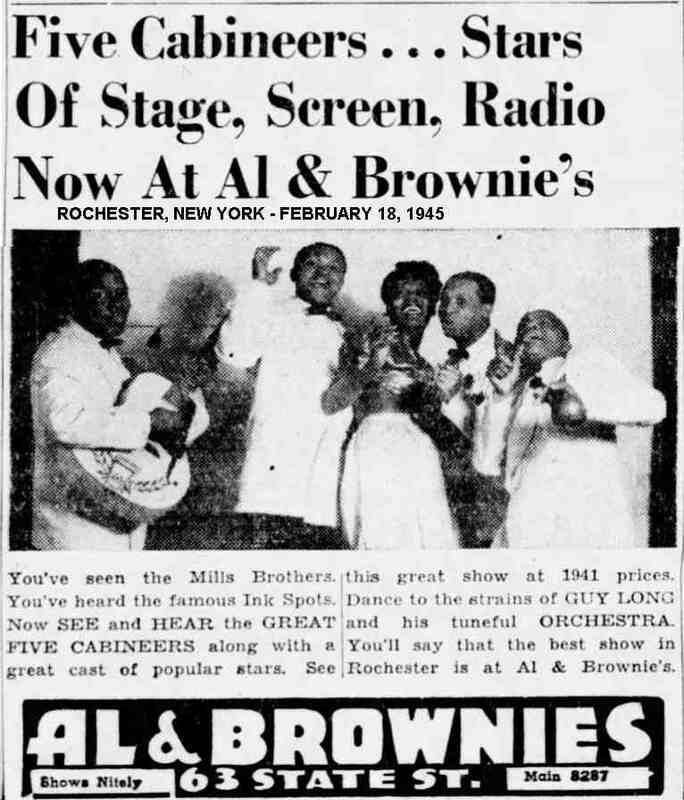 However, based on an article in the September 7, 1939 Cleveland Call And Post, they seem to have been a gospel group. Whatever happened to that group remains a mystery. 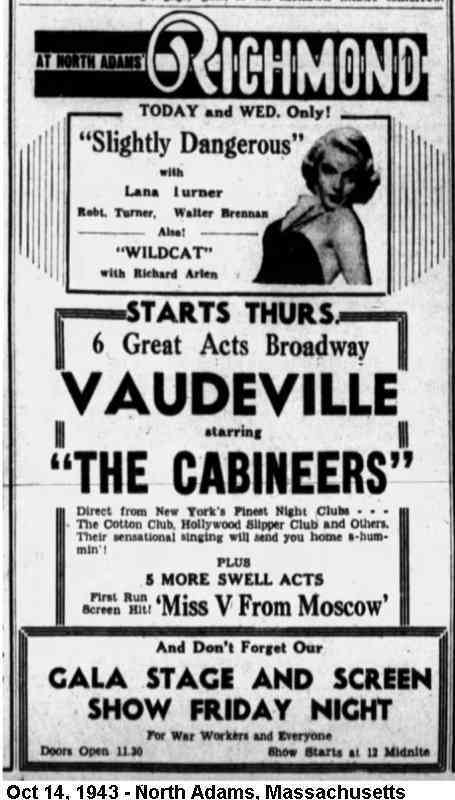 What we do have, however, is a picture of "The Cabineers" in the April 26, 1941 edition of The New York Amsterdam News entitled "Popular Over Airlanes." The photo, three guys and a gal, identifies: William Westbrook (the founder of the group), Maggie Furman (alto), Count Cablo (baritone and arranger), and Matthew "Matt" McKinney (bass). A small blurb tells the reader that they "... are doing a swell job over radio station WINS, appearing over the airlanes every day (Monday through Friday) at 5:30 p.m. The group's fan mail indicates they are popular in Harlem." Decca Records files show that the Westbrook group was signed sometime in late 1940. Their recording career officially began on December 11 of that year, when they cut four sides: "How Was I To Know," "Lindy," "Let The Party Go On," and "Sweet Louise." All of these feature Bill Westbrook on tenor lead. However, Decca was in no hurry to issue any of these songs. It almost seems as if they were waiting for the Cabineers to achieve radio fame. The first two tunes were finally released around April 1941; the others were coupled for a November 1941 release. Both discs are extremely rare today. Judging from these early sides, this group had to have been together a while. They are tight and very smooth, their vocal antics fitting in nicely with similar radio groups of that era (for example, the 4 Vagabonds and Charioteers); all of the sides are accompanied by nothing more than a piano. Their ballads could be called quite traditional, almost Mills Brothers-ish in some respects. (And why not? The Mills Brothers were at the top of their game then.) "Lindy" is a medium beat, rhythm ballad, "written" by Maggie Furman (although it's really an older blues that was part of Li'l McClintock's "Don't Think I'm Santa Claus" in 1930). It features some horn simulation and the bass singer's "walking" tempo so indicative of the great groups back then. "How Was I To Know" is a tight, unison harmony ballad, with Westbrook's tenor lead in the middle. "Sweet Louise," similar in some ways to the 5 Breezes' version (which had been cut for Bluebird the year before), is given its own medium-tempo identity with both tenor and unison harmony (the tonality is almost orchestrally smooth). "Let The Party Go On" is just what the title suggests: a jumping, jive-based item with some fine vocal-instrumental simulations and vocal "puckers" (yes "puckers") at one point. It isn't hard to see why this group would become so coveted by collectors aware only of their later Abbey and Prestige recordings. But this was 1941, and war was brewing (not only overseas, but with the musicians strike [the "Petrillo Ban"], which ran from August 1942 to September 1943). The Cabineers were to make no further recordings for almost eight years. 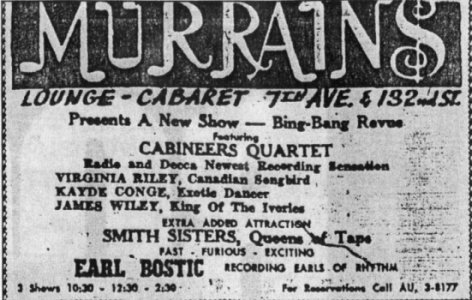 On August 22, 1942, "Margo, of the Cabineers" was a performer at something called the "Coffee Hour Concert." 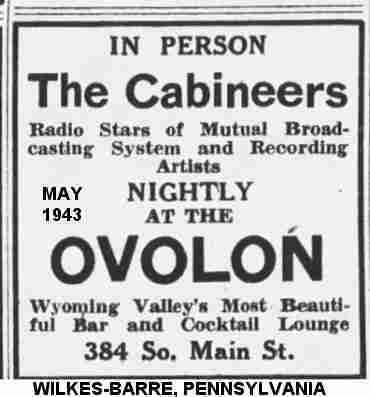 The whole group appeared at the Lyric Theatre (Fitchburg, Massachussets) in November 1942; at the Court Square Theater in Springfield, Massachusetts, in December 1942; at the Penn Vaudeville Theater (Wilkes-Barre, Pennsylvania) in mid-May 1943; at the Ovolon Theater (also in Wilkes-Barre) later in May 1943; and at the Richmond Theater (North Adams, Massachusetts) in October 1943. In February 1944, some of their names appear in a list of performers that had helped out at the New York Stage Door Canteen. Maggie Furman, Bill Westbrook, and Matt McKinney appear on this list (although his name is spelled "Mack"); Count Cablo isn't on it. There are hundreds of names on the list, so, although we can eliminate Alfred Drake, Chico Marx, and Roy Rogers, there's no way to know who the fourth member of the group was at that time. 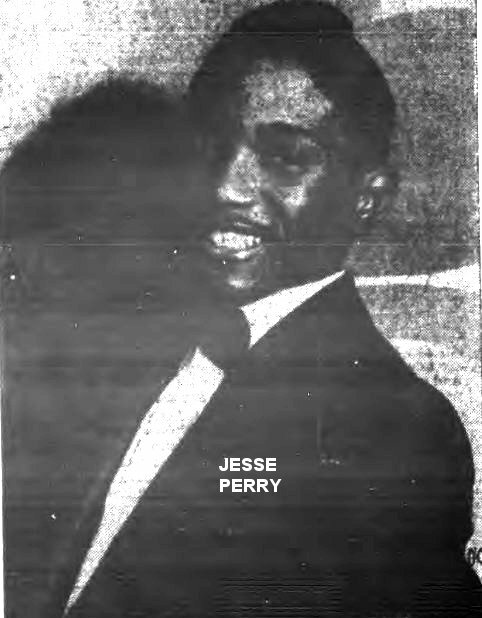 There was a blurb in the February 19, 1944 issue of the New York Age that said Jesse Perry, Junior, an 18-year old baritone, had recently joined the Cabineers (who were then three males and one female, all unidentified). The group was soon to open in Portland, Maine. Jesse had been (the blurb said) a soloist who'd appeared at the Orchid Room of Smalls' Paradise. He was with them at the end of April when they played the Feeley Theater in Hazleton, Pennsylvania ("five colored singers"). 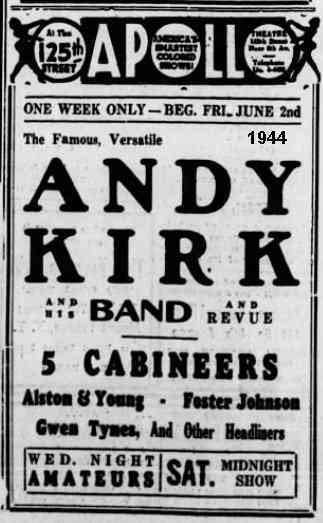 Was he part of the group when they, and Andy Kirk, played the Apollo in early June (as the 5 Cabineers)? We know that Perry was with Earl "Fatha" Hines at the Earle Theater (Philadelphia) in early July of 1944. He seems to have become ill when Hines was in California in December and was fired while in the hospital. He went on to have releases on Modern Music (as vocalist for the Happy Johnson Sextet), Uptown (as vocalist with Sam Price's Orchestra), Abbey, and Derby (or, at least he was signed to those two labels). 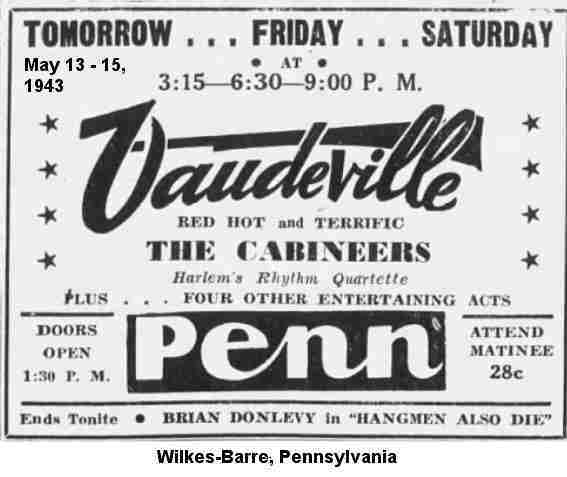 When they played the Towers, in Camden, New Jersey, in September of that year, they were only billed as the "Cabineers", but when they were back at the Apollo in November, it was as a quintet again, so we know that Jesse Perry had been replaced. 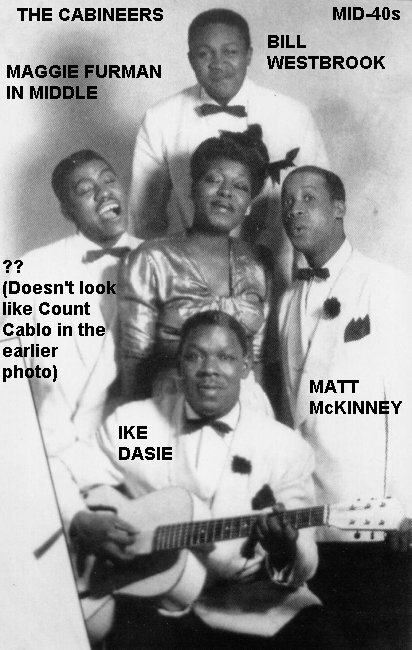 When I interviewed Adriel McDonald (future bass of the Ink Spots), he told me that both he and Herb Kenny (brother of Ink Spots lead Bill Kenny and another future bass of the group) were non-recording members of the Cabineers; this would have been in mid- to late 1944. 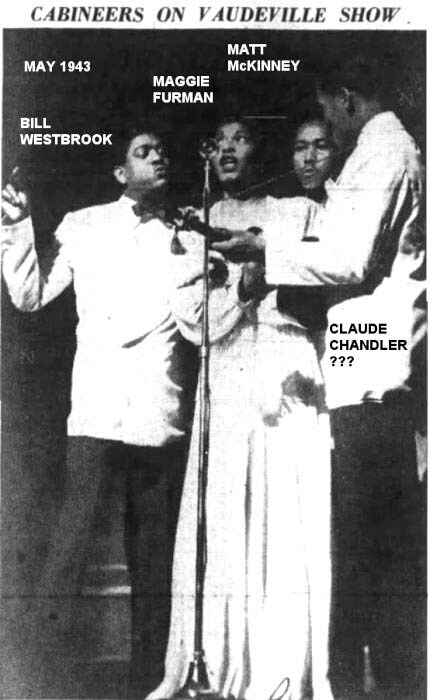 The other members at the time were Bill Westbrook, Maggie Furman, and guitarist Claude Chandler. So what happened to Count Cablo and Matt McKinney? Since it was wartime, the most probable scenario is that they were both in the service during this period. McKinney re-joined after the war. I'm not sure if Count Cablo ever returned. 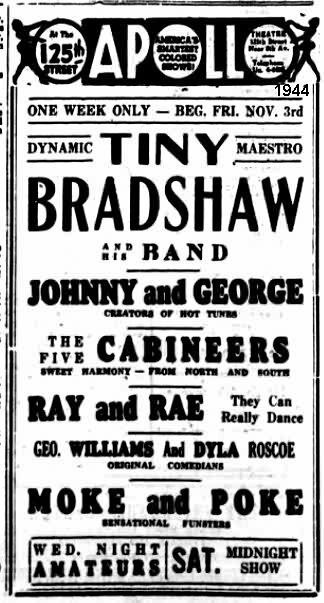 The week of November 3, 1944, the "Five Cabineers" played the Apollo again (along with Tiny Bradshaw). It's possible that Herb Kenny and Adriel McDonald were part of this group, but there's no way to know for sure at this point. Herb joined the Ink Spots in March 1945 (bringing Adriel along with him as a valet); before that, they were both in a short-lived group called the Melodeers (whose bass was Jimmy Ricks). 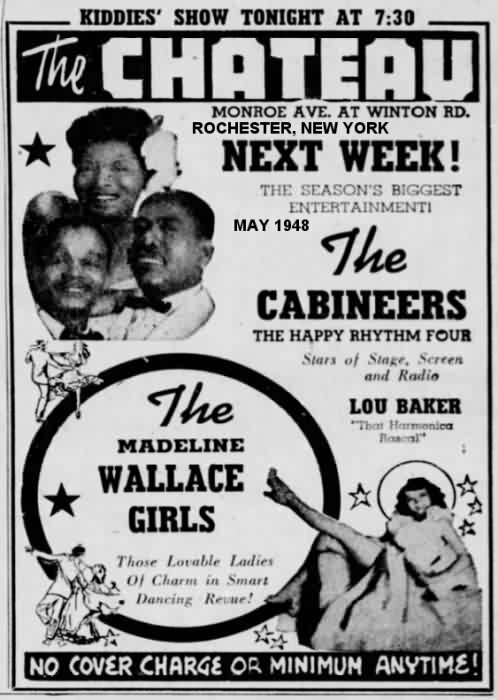 The week beginning December 15, the Cabineers were at the Paradise Theater in Detroit. 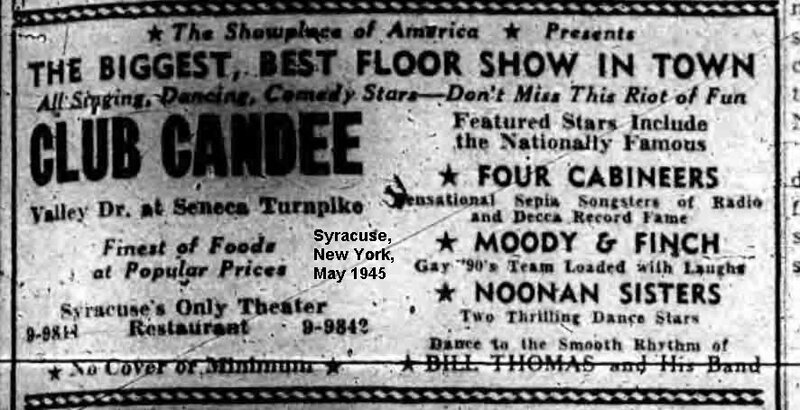 In May 1945, the Cabineers appeared in the Western Tier of New York: Buffalo (the Havana Casino) and Syracuse (Club Candee). At the latter venue, they were billed as the "Four Cabineers." It's interesting to note that the reviewer expected something to be released by Decca in 1946. 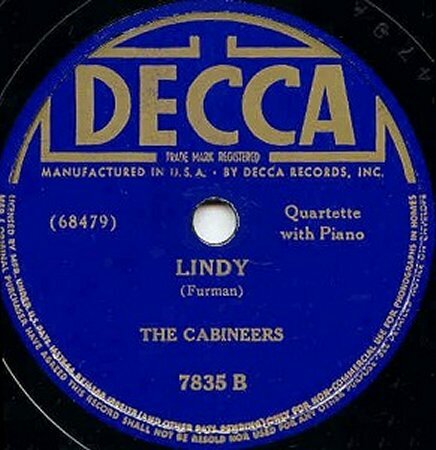 In fact, there's nothing in Decca's files to indicate that the Cabineers ever recorded for them again after 1940, nor were there any unissued tracks from the first session. Note, too, that at least Matt McKinney is back with them (the fourth singing member wasn't named). Of course, since they'd been at the Apollo, it wasn't their first Harlem appearance. 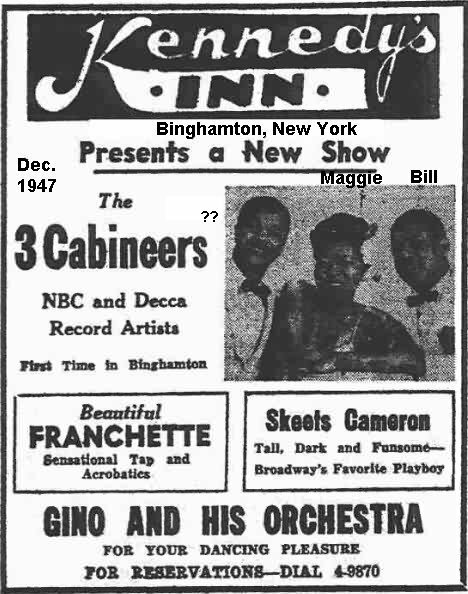 December 1947 found the "3 Cabineers" at Kennedy's Inn, Binghamton, New York. The photo shows Bill Westbrook, Maggie Furman, and one other member that I can't identify. For some reason, Matt McKinney wasn't in the photo or at the engagement. 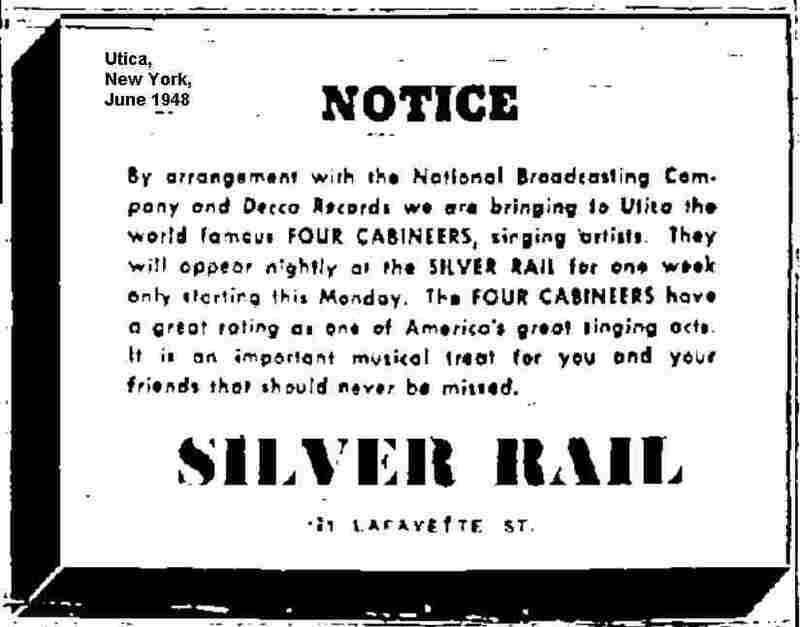 Presumably Matt came back, because the following June, the "Four Cabineers" were at the Silver Rail in Utica, New York. 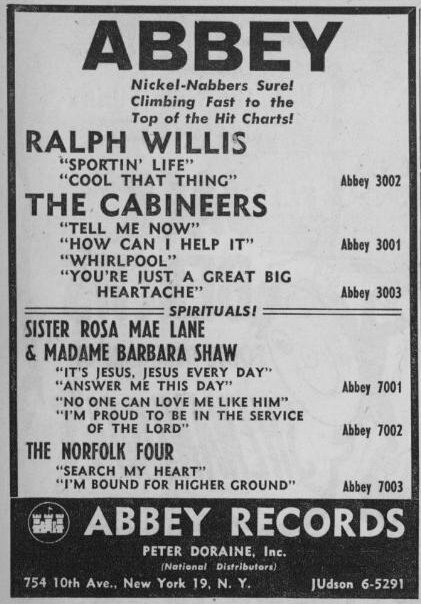 In July or August 1949, the Cabineers held a session for Peter Doraine's newly-formed Abbey label. The four songs recorded were: "How Can I Help It" (led by Maggie, with Bill on the bridge), "Tell Me Now" (led by Bill, with Maggie on the bridge), "Whirlpool" (fronted by Maggie), and "You're Just A Great Big Heartache" (also Maggie). Doraine released "Whirlpool"/"You're Just A Great Big Heartache" in August. Their harmony is still mellow and smooth. Appearing or not, they'd been practicing! 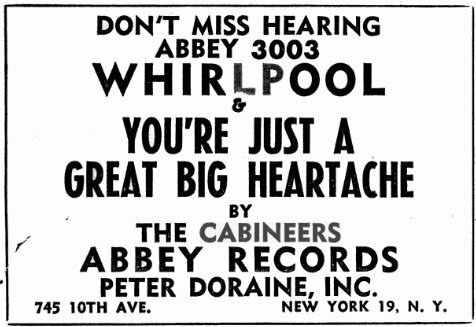 The songs were reviewed that same month by Billboard, with "Heartache" receiving a 78, and "Whirlpool" getting a 67. Other songs reviewed were the Jubalaires' "This Day Is Mine," Dave Bartholomew's "Country Boy," Jimmie Preston's "Rock The Joint," Lightnin' Hopkins' "Jailhouse Blues," and the Rhythmasters' "Until Now." 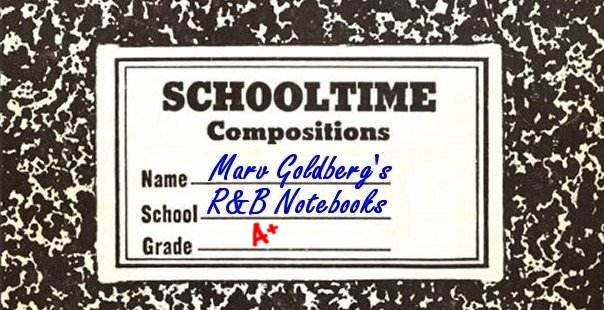 The other two songs were released, in September, on Abbey's new 3000 R&B series. That same month, "Whirlpool" was re-issued in the same series; all the Abbey discs are quite rare. On December 5, 1949 they appeared on the Arthur Godfrey Talent Scouts show, singing "Darktown Strutters' Ball". I don't know if they won. It took a while, but the week of January 28, 1950 found "Whirlpool" listed as a Territorial Tip in the New York region. It was #4 in Cash Box's "Hot In Harlem" list on January 21. Somewhere along the way, the Cabineers got a television show in Boston. The February 11, 1950 Cash Box said: "The Cabineers, Abbey Record stars, have been renewed for another thirteen weeks on WBZ-TV, Boston [channel 4]. The group are currently riding high with 'Whirlpool'." In spite of this, I can only find three listings for them (February 24, March 10, and March 24), all on Friday at 7:00 PM. The time slot usually just says "Piano And Song" (but that could easily refer to Joy Carryl) or, occasionally, "Musical Quartet And Piano". The group's next (and last) appearances on record were in 1951 and 1952, for the Prestige label (noted for its jazz output); their signing was announced at the end of June, 1951. The first Prestige session, held on July 2, 1951, produced "Each Time," "My, My, My," "Lost," and "Baby Where'd You Go." All were led by Maggie, except for "Lost," which featured Bill Westbrook (who'd moved down to baritone by this time) and Maggie. (This wasn't the only change; at some point, Nat Nazarro had been brought in as manager; he had once managed the Red Caps.) Instrumental backing was provided by the Mercer Ellington Quartet, which had Billy Taylor on piano, Sal Salvador on guitar, Sam Bell on bass, and Ellington on drums. "My, My, My" and "Baby Where'd You Go" were paired for a July 1951 release. When this failed to take off, Prestige released the pretty "Each Time," backed with "Lost" on its Par Presentation subsidiary in September; it was re-issued on Prestige in early October. "Each Time" was rated "good" and "Lost" was given a "fair" the week of October 20, when other reviews went to Charles Brown's "Seven Long Days," Dinah Washington's "Be Fair To Me," and the Red Caps' "Boogie Woogie On A Saturday Night." 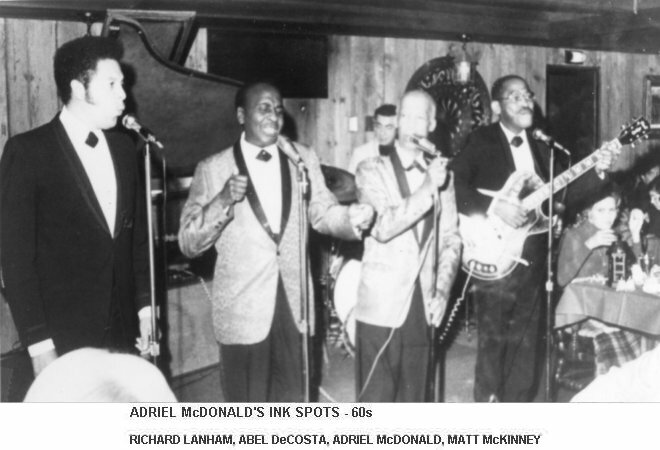 At this point, for unknown reasons, Matt McKinney quit the Cabineers; He would end up with several of the 60s and 70s Ink Spots groups (one photo shows him with Richard Lanham, Abel DeCosta, and, interestingly enough, Adriel McDonald). At the same time, the fourth member, whoever he might have been, also left. Thurman Ruth was baritone of the Larks at this time, but he still kept in touch with his gospel roots. 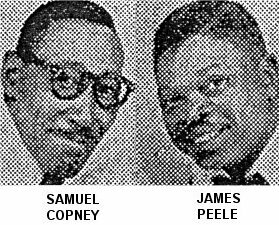 Thus, when Bill Westbrook told him of the openings in the Cabineers, Ruth spoke to a couple of members of the Keys Of Harmony (tenor James Peele and bass Samuel "Brother Brown" Copney) about filling the spots. 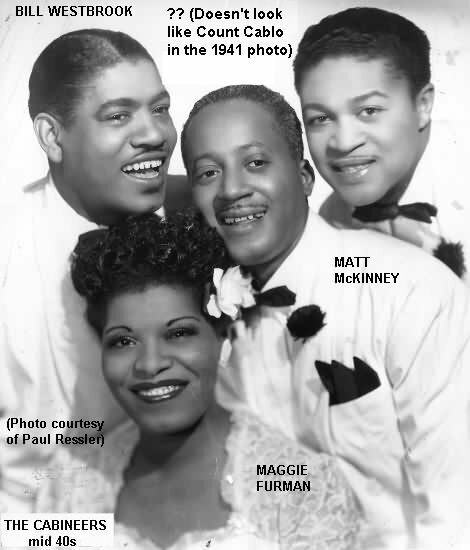 Therefore, it was the team of Westbrook, Furman, Peele, and Copney that recorded the last two Cabineers songs: "Baby Mine" and "What's The Matter With You" on December 20, 1951. Both were led by Maggie Furman (who, by now, was probably Maggie Westbrook), with a prominent assist from Sam Copney on "What's The Matter With You." This time, the backing group was bandleader/pianist Teacho Wiltshire's Band (whose only other known member at this time was Lem Davis on alto sax). The sides were issued in January 1952, and were rated "good" on February 2, along with Peppermint Harris' "Let The Back Door Hit You," Dinah Washington's "Wheel Of Fortune," the 5 Key's "Yes Sir, That's My Baby," and Gene Ammons' "Until The Real Thing Comes Along." 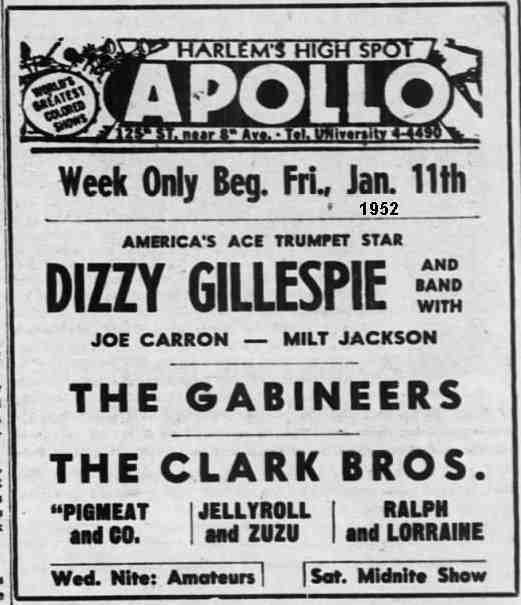 Sam said that the group got a lot of bookings, including the Apollo (the week of January 11, 1952; the headliner was Dizzy Gillespie, but the group made it to the ad as the "Gabineers"), Harlem's Baby Grand, and the Irvington Hotel, in Lakewood, New Jersey. The Cabineers were to stay together for another couple of years. At that time, Sam and James were turned off by the lifestyles of secular performers. After seeing all the drugs and the booze (Bill Westbrook was a big wine drinker), they decided to re-join the Keys Of Harmony and continue with gospel singing. The last appearance I can find for them is at Joyce's Log Tavern, in Troy, New York, in May 1953. As far as is known, that was the end of the Cabineers. By the mid-70s, Bill Westbrook had died and Matt McKinney passed away in March 1981. Probably all of the others, with the exception of Sam Copney, are gone too. In 2000, Sam was still singing gospel (with Charlie Story and his All-Stars). Maggie Furman's granddaughter, singer Monica Green, informed me that Maggie, who was living in Rochester, New York, passed away in March 2006, at age 89. The Cabineers made some wonderful music, it's a shame more isn't known about them. Special thanks to Charlie LaRocco, Galen Gart, and James Passantino.